If you look up the meaning of crazy cat lady you will find the stereotypical definition depicting a single woman; a middle-aged or elderly spinster living alone with her many pet cats. However, with the increased popularity of cats in recent years thanks to social media and YouTube, the cat has become a beloved pet in many a household. Statistics show that in some countries the cat has become one of the most popular pets to have. The probability of you knowing a couple of people with a cat is very good. In the U.K alone there are 8 million cats. According to Live Science in 2013 the second most popular pet in the world was cats with 88.3 million. Now being referred to as a ‘crazy cat lady’ is a term of endearment and no longer has the same negative connotations to it. Cat lovers, LOVE cats, all cats, and they aren’t ashamed to show it. Being a ‘crazy cat lady’ is a badge of honour and worn proudly. They usually have more than two or three cats. Rescuing cats is their passion in life. Their clothes are decorated with cat hair, especially black clothing. A lint roller is easily accessible (always). A mini lint roller can be found in their handbag. They talk back to their cat when he meows at them. Poop-scooping is part of their daily routine. The cats take over the bed and usually you can’t move. A new partner must love cats. They have extensive cat photo galleries on social media. Watching cute cat videos on the internet and then sharing them. They can’t understand why some people don’t love cats. The home décor might include scratching posts or a cat tower and some cat toys lying around. Shopping for gifts can be tedious, but it doesn’t have to be when it comes to your cat-lover friends. Here you have an advantage! There are a lot of cat lover gifts available. If you go the cat-themed route, no matter if your friend is cat-lady level or merely fond of felines, there are gifts out there that they will love, ranging from cat-themed socks to a cat-plastered cushion. If you need a gift for cat lovers or your ‘crazy cat lady’ friend, then these forty cat gifts won’t disappoint. These are only a few from hundreds to choose from. Make leaving notes fun with this collection of cat sticky notes. Who won’t love reading your notes now? 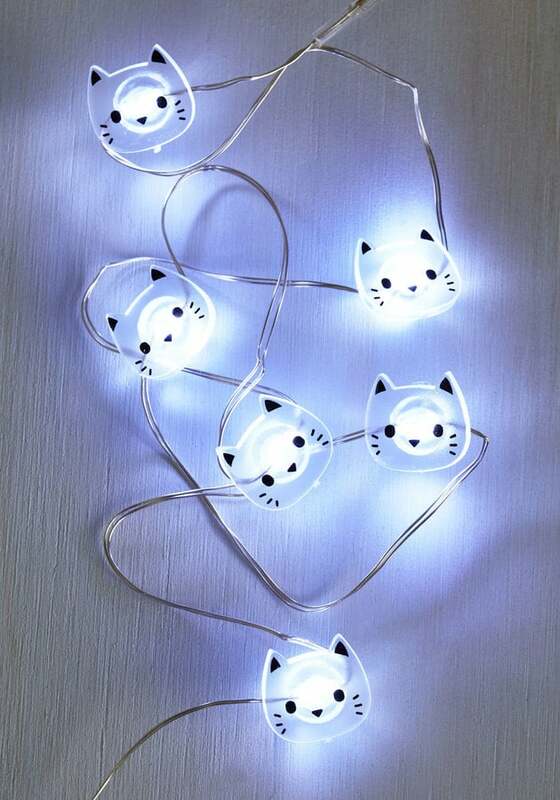 Everyone loves fairy lights, and they just got a whole lot more awesome by being cat shaped!! Having a bad day? Put on a pair of these. Secret (or not so secret) cat socks make everything better. Add some cat-shaped silver to their jewellery collection. To the world it’s 10:10, to you it’s cat o’clock. Twelve cats in different poses with a black faux leather strap. It’s not just cat-tastic but also tells the time. In 4 different colours with rose gold casing, this quartz watch is a great gift to adorn any crazy cat lady’s wrist. If your crazy cat lady loves s bit of fun jewellery, charms are a great gift. You can even set up the charm bracelet with a few to get her going. Based on the international bestselling book of a true story. Snuggle up with your cat and watch the true feel good tail of how James Bowen, a busker and recovering drug addict, had his life transformed when he met a stray ginger cat. I watched this on a plane from Dubai to Edinburgh and it was such a heartwarming story. Every cat owner needs a cat keyring. JOYJULY have four different kitties to choose from. And if you can’t choose, you can always get one of each! Don’t put your cup there, use a coaster and get some inspiration at the same time. No need to explain why you’re not going out! Did you say a wallet with cats on, yes please! There are six different colours to choose from. Paying for something has never been more fashionable. I actually just bought myself one of these! This awesome set of bags included a backpack and 14″ laptop carry case and comes with a few different animal designs. Of course, the cat one is the best and has 3 different coloured versions available. Display it proudly. Yes you are a ‘crazy cat lady’. The pop-art inspired style coupled with the sleek pose of the cheeky cat hints at a graceful, yet mysterious, design that attracts an essence of intrigue to its bearer. It’s bag with cats on! Need I say more? Enjoy a warm mug of milk or your favourite tea, coffee or hot chocolate out of this cute cat mug that comes in both black and white. Everyone loves a good mug! This cute cat family will look in right at home on any sofa. Add this cushion to any room to enhance your home décor. Everyone needs a bottle opener, so why not get a stylish one? You can also stick these to your fridge for an easy to find storage space. Shopping for a cat lover can be tough. Realistically, you can’t buy them a cat, and buying someone cat toys or accessories for a birthday or celebration is a little passé. Thankfully, from the cat gifts we’ve chosen and listed above for you, finding gifts for cat lovers won’t be as daunting. There is everything you could imagine cat related that will guarantee the ideal gift. Depending on your budget for the gift, you can buy one big item or combine a few small items to create a cat-tastic goodie bag. Whichever gift you choose your cat-lover friends will appreciate the thought you put into it. Happy cat gift shopping! In true Crazy Cat Lady style, here are 5 of the 8 cats that live with our writer, Jennifer, in Roodepoort. Here we have Mia, Abbey, Milo, Buddy and Hunter, from left to right.